Silk sarees are so enhanced by themselves but the beauty of the saree is doubled when it is paired with trendy and classy blouse designs. 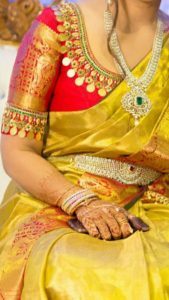 This is such an era where you need to give equal importance to your bridal blouse designs as like your bridal sarees. 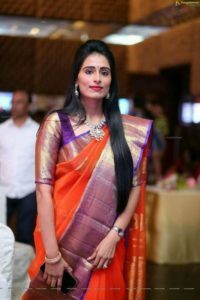 The design should be unique with good pattern works, so it is important to know the latest trends in silk saree blouse design patterns. 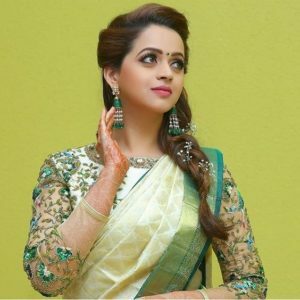 In this article, we have collected the top 14 trending silk saree blouse designs so that you can choose the best design and get an amazing look for yourself. 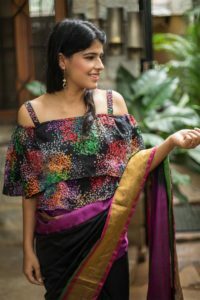 It was times when high neck blouses are said to be ‘out of fashion’, but now this is the latest trend which is the most preferred style for pattu saree blouse designs. So, if you are looking for a perfect ethnic style then close round neck would be the best choice for special occasions. 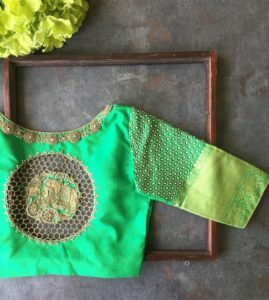 Puff sleeve is one of the most commonly known blouse design which is travelling with us for our childhood days. 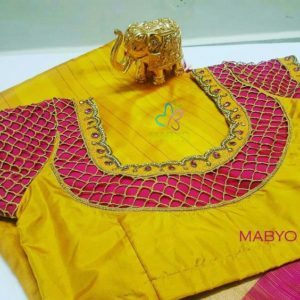 We all love to try out this sleeve design for our silk saree blouse but this time you can add some essence to this design by going for an elbow length design. This pleated puff sleeve with border design will definitely give an elegant look to your silk saree. Collar necks are one of the trending blouse designs in recent times. Whether it is self-design or contrast colour saree a cool collar neck will go very for party and wedding occasions. 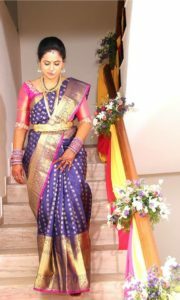 Borders are the best thing about silk sarees which makes it look much prettier and classy look. 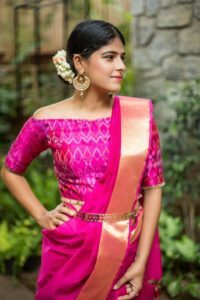 To make the look much higher, you can try out the same border in the silk saree blouse sleeve without any work. Make the blouse look more classy by opting for a bigger size border and plain elbow length sleeves. 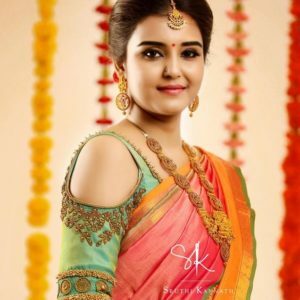 The cold shoulder is one of the trendings blouse designs for pattu sarees. This kind of blouse is usually designed with jewels and beads to give a rich look. 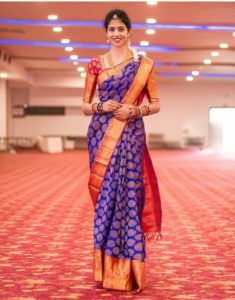 If you want to go for a rich and trendy look in your Kanchipuram silk saree then you can contemporary look to your traditional outfit. Maggam work blouses are one of the evergreen design patterns which never goes out of trend for bridal blouses. To add extra essence to the design we can incorporate the latest designs works with zardosi patterns and make them look different from usual patch works. The craze for floral design blouse is rising on the top these days. 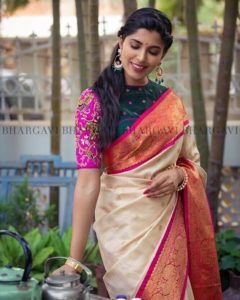 The best way to add a trend to usual floral design is by adding a contrast color combination to get a different floral maggam embroidered blouse for your silk sarees. Other than jewellery and beads, coin work blouse design is the best way to give the blouse a much richer look. 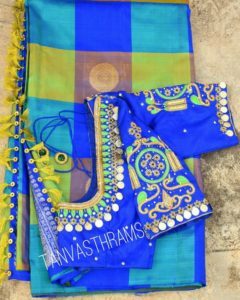 You can customize the design as per your wish by making the coin work flow entirely through your back neck design of your silk saree. 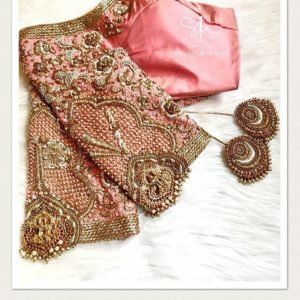 Kundan work is so much in fashion in Indian bridal wears these days. 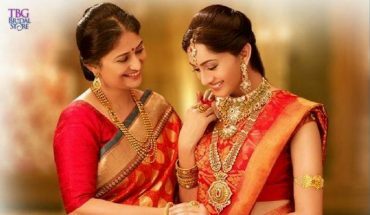 From jewellery to attires, one can find a detailed work of Kundan work everywhere. 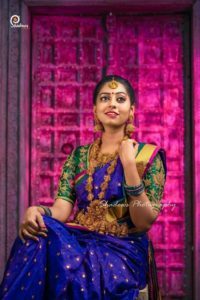 Below you can see a detailed beautiful collection of Kundan work silk saree blouse design where the sleeves are heavily crafted with zari and kundan work. 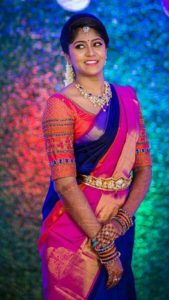 Cutwork blouse sleeves patterns are the best design pattern to make you look stylish in your silk saree. 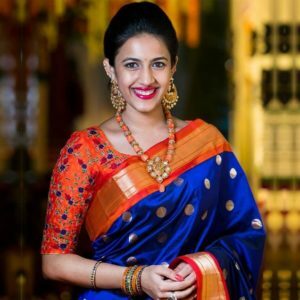 Give it a try this time to give a stylish look in your silk saree. 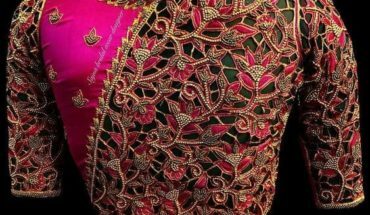 Usually, bridal blouses are given more importance with heavy embroidery work like zardosi, kundan, beads and heavy tassels. 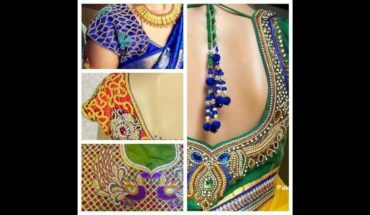 Temple work is one of the trending design in bridal blouse design where heavy temple sets are placed in the blouse to give an ethnic look to the blouse. If you want to give a modern look to your silk saree then jacket blouse would be the right choice. 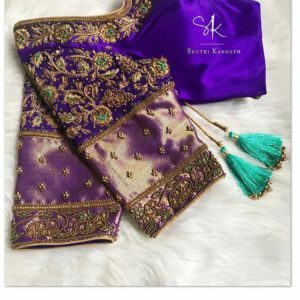 Have a look at the below pictures to get an idea of jacket blouse designs that best match your silk saree. 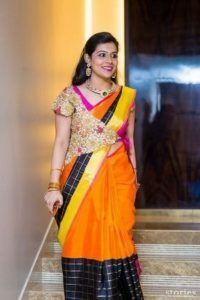 If you want to give a major preference to your silk saree than your blouse then you can go with this style. 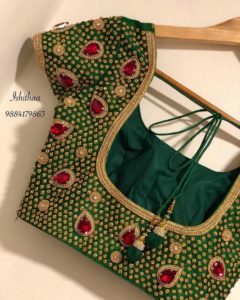 Full sleeve blouse designs will give you a beautiful look without any embellishments or heavy embroidery work on the blouse. You can go for a simple plain full sleeve blouse or designer printed one based on your choice. 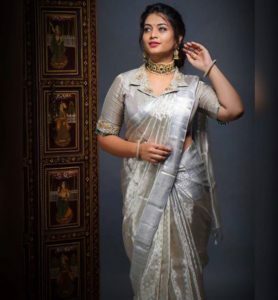 Silk sarees are considered to be most traditional sarees but now this can be overcome by pairing it up with a modern blouse outfit such as off shoulder blouse. 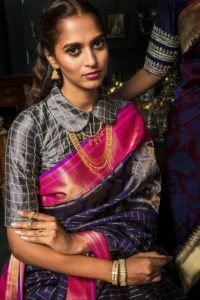 These are the latest silk saree blouse designs trending these days. Some people may not be having about this new silk saree blouse designs! But after reading this their will definitely got an idea about it. Try this latest trends and comment your favorite in the comment box.